Learn & Serve’s “48: A Slum Experience” Retreat Coming Soon – Sign up Now! Although forty-eight hours may not be enough time to travel to a developing country and back, it is enough time to get a glimpse into the everyday life of over one billion people on our planet. 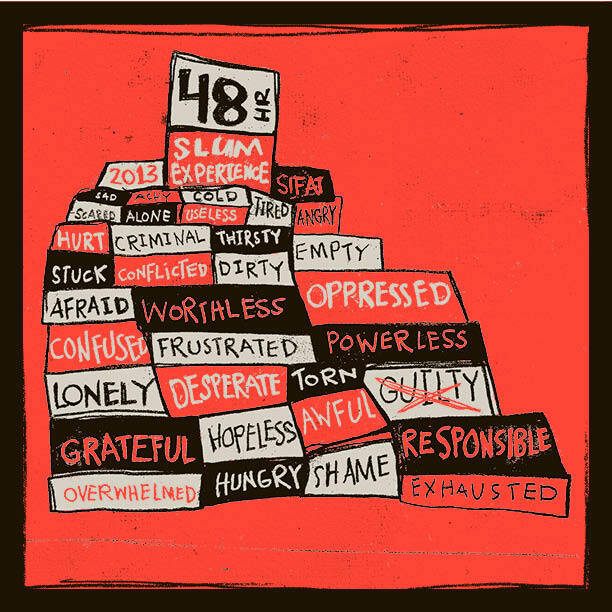 This coming January, Learn & Serve is offering our fourth annual “48: A Slum Experience”. For forty-eight hours, participants will have a chance to immerse themselves in a simulated urban slum and learn the struggles of people living in these environments. Students interact with common challenges associated with living in a slum, such as dirty water, prostitution, HIV/AIDS, mass evictions, hunger, unemployment, corruption and the social havoc that each of those struggles can create within a community. Check out this video for footage and feedback from last year’s “48: A Slum Experience”. Interested in volunteering to staff this retreat? Click here and download the 48 Volunteer Application!